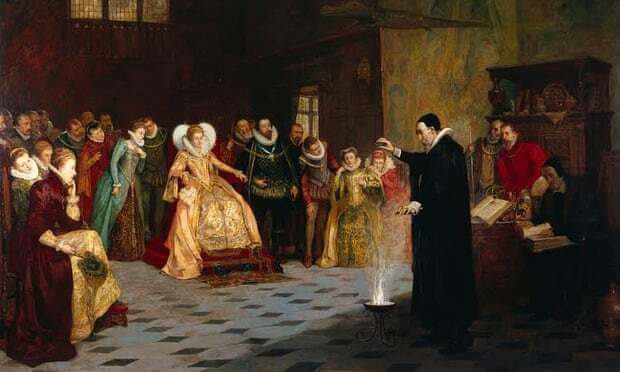 Painting of John Dee Originally Featured Ring of Skulls – Zero Equals Two! The Guardian recently ran a feature regarding “Scholar, courtier, magician: the lost library of John Dee,” a free exhibition at the Royal College of Physicians which will run from January 18 through July 29.” Among other artifacts the exhibition features some of the books from Dee’s personal library. Dee was court astrologer of Queen Elizabeth I, and … well, YOU know! “Hidden beneath a painting of the enigmatic Tudor polymath John Dee performing an experiment for Elizabeth I is a dark and slightly terrifying secret, research has discovered. 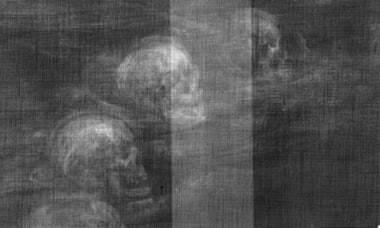 “X-ray imaging of the stately Victorian artwork has revealed that Dee was originally surrounded by human skulls before the ghoulish image was painted over, probably because it was too odd for the buyer. But curators of an exhibition opening on Monday believe it sums up the conundrum of Dee: should we remember him as brilliant pioneering scientist, or as an occultist who thought he could talk to angels?